Well now, how about that for a rocking afternoon at The Emirates, eh? Where to even start on this Monday morning? I mean obviously the final result feels like the best place to start and a 4-2 win over your local rivals, when you’ve been told all week by pundits that they can’t see how Arsenal win this game, it feels like a happy ol’ way to start a Monday. Seriously now British media, you’re going to have to stop predicting a power shift each season because from where I sit, all the Totts have done is to bring themselves level – possibly slightly better – than us in the last few seasons. But in the same way that one good result does not a season make, one or two decent seasons from that lot does not a Power Shift make I’m afraid. What we therefore saw yesterday was two teams at the top end of the division who battled it out. This Tottenham team is not miles better than us, we’re not better than them, so pre match talk of ‘combined XI’s, of so few Arsenal players getting in to the Tottenham team is as premature as the hype that surrounds the media darlings that Tottenham are. What we saw unfold on our patch yesterday was an Arsenal team that are growing game-by-game and despite being told that we’re not good enough by a lot of the media, these players stepped up and delivered for us. And the feeling this morning is delicious. The fact that the team also reacted after going behind to a Son dive is also a massive plus point for us to point towards today. This Arsenal team have something about them and they are certainly not ones who go within themselves after going behind. Which is just as well because we once again went into halftime behind although for some reason even during the beverages in the concourse I wasn’t as angry as I thought I might be. Perhaps it was because there was a sense of injustice about the total non-pen that the Totts got. It was softer than butter that’s been left in the sun all day and hopefully Mike Dean has a long, hard, look at himself when he watches it again. But let’s not hold our breath with someone like that eh? as usual though the second half was Arsenal’s, although it didn’t start out that way. Tottenham has the better start in the second and I did wonder if this game would get away from us within the first few minutes but credit to the manager and the players because we quickly asserted ourselves. And we did so with the help of El Boss and his tinkering, bringing on Ramsey and Lacazette who between them changed our shape and also the game. Both were great and posed a question to Tottenham that they didn’t have an answer for. Ramsey has energy, found space, was excellent with his distribution and had a hand in both the second and third with some great distribution to both Auba for his sumptuous out-of-the-box screamer, as well as Lacazette’s slightly deflected goal to put us back in front. Ramsey has a part to play this season and you know he’s going to give his all for the club until he does and ultimately that’s all we should be asking of him. The question many might have is whether Unai considers bringing him a little closer to the Premier League first XI than he has been? Think Beckham and the way he fought back in to Capello’s Real Madrid team after it was announced he’d be joining LA Galaxy halfway through the Spanish season. Perhaps that’s something that could happen with Ramsey? You never know. What we do know is that we’ve got a manager who isn’t afraid to make tough calls. Mkhi and Iwobi hooked at halftime is a classic example of that and for a club who has spent 20 years of seeing arbitrary subs on 75 minutes this is all new to us. But as Match of the Day pointed out Emery is making subs and they are making the difference more than any other side. You can question his initial team selection decisions but by and large this season you can’t question that he doesn’t know how to use his bench effectively. The same bench that Eric Dier told Aaron Ramsey to sit back down on. Glad he did because if it gave Ramsey that little extra fire in his belly then that’s all good with me. And do you know what else is good with me? Seeing Lucas Torreira in an Arsenal shirt every week. This kid has got it. Energy, technique, composure, positional understanding, tenacity, all in spades. 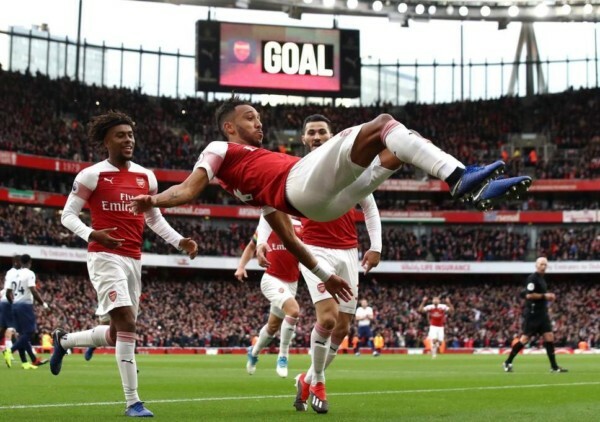 He had a couple of pot shots yesterday that went wide but when Auba slipped him in so he was one-on-one with Lloris, it looked like it could have been Ian Wright in on goal with the way he finished. This kid is going to be a star and I just hope we can have him at Arsenal for many, many, years to come. He was a deserving man-of-the-match and he gives an option for defenders, wins the ball high up the pitch so we can take advantage of a style of play Emery is known for, he is defensively mindful but he is also everywhere. We lamented the whole Kante to Chelski situation as many thought we should have gone for him, but on the path that Torreira is going we’re going to have a player just like, as good (if not better) as Kante in no time at all. It’s difficult not to just pick out every single performer in an Arsenal shirt today, because every single one of them was up for this and it showed from the start; take Bellerin and Kolasinac for example. Both were great and found space out wide time and time again. It was such a surprise to see the Totts give them the freedom of the Emirates but it was from wide positions moving in that we troubled them and so both fullbacks stepped up to deliver. Perhaps you can have question marks about Leno but in the second half he half made up for his flappy hands on the goal by pulling out a smart save after Bellerin had gifted Son a wonderful opportunity about 25 yards out. But today isn’t a day in which we should be chastising any players for any individual error or mistake because the team all did what we’d all hoped for. I’ll be honest and say I didn’t see us winning it. I thought the Tiny Totts would be better defensively than they were and I thought they’d score, so I thought it would be a tough afternoon to get three or more against that lot. But what I’m starting to realise is with our attacking players we have options and ability to bag goals at any time. As long as it’s in the second half! Right, that’s probably all the waxing lyrical you need from me today, so enjoy the rest of yours and remember: North London is Red. Brilliant post which sums up the feelings of every true goner today. The Emirates yesterday was rocking and apart from the Barcelona game I cannot think of such an atmosphere. Apart from getting the team to perform Unai has got the fans playing as well!